We send lot of emails with attachment files like Word documents, images, mp3 and video files. Gmail already got ‘Email attachment detector’feature that reminds you to attach files to specific emails. Now you have similar functionality in Outlook 2007 with the help of Missing Attachment PowerToy. Related – Read blocked Outlook attachments, just unblock them! With this add-on you will never forget attaching files to emails that should have one. It should save time, effort and embarrassment of having to send email again (this time with attachment). This add-on works by checking list of specific keywords. If your email message contains any of the specified word, you will get attachment reminder prompt. In options dialog box, goto ‘Missing Attachment’ tab and add keywords that should trigger and remind you for attaching files to specific emails being sent through Outlook 2007. 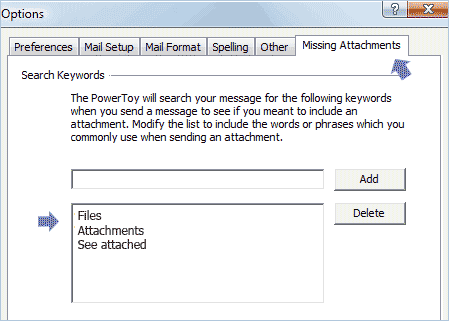 Download Missing Attachment PowerToy to save time and prompt reminder for attachments.